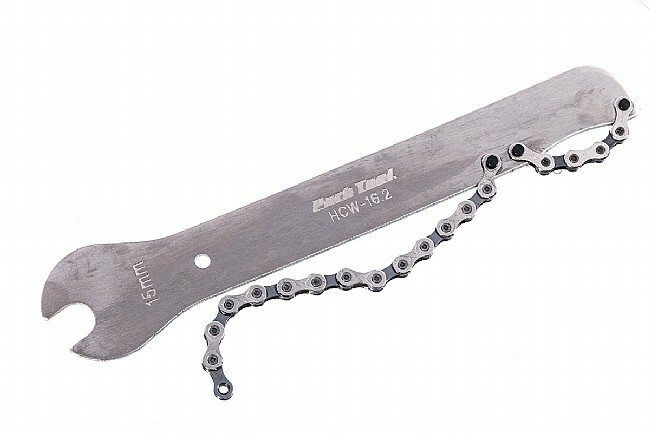 The Park Tool HCW-16.2 is a combination 15mm pedal wrench and a chain whip. Use for both pedal removal/installation and for cassette removal. Chain whip is compatible with 5–12 speed cassettes. The HCW-16 is 10.75" long (27.3cm). Combination 15mm pedal wrench and chain whip. Usable for pedal removal and installation, as well as cassette removal. Compatible with: 5 – 12-speed cassettes and freewheels. Park tools always work and I have not had any problems. As others have mentioned in reviews, wrapping a rag around the wrench makes it a little more comfortable when installing pedals. This is a very basic tool but a good one. Plus it has a pedal wrench on the other end! Does the job, wrap it with a towel for comfort. Does the job, the price is right. I wrap the handle with a towel for comfort when wrenching. Are there nicer chain whips, yes. Are there nicer pedal wrenches, yes. This tool is an excelent value with 2 tools in 1 and does exactly what it is meant to do well. It works much nicer than using an old piece of chain with vise grips as a chain whip for cassette removal. Another quality product from Park Tool. Both pedal wrench and rear cassette chain whip work great. I used this for both 10 and 11 speed shimano/sram cassettes and seemed to work fine. Well built tool. You could pay extra for the ones with a padded grip but why the heck would you? Works great. The wrench is nice and flat to stay clear from damaging your spokes. Makes cassette removal and pedal removal quick and easy.